No one would use the word perfect to describe the weather in November in London. 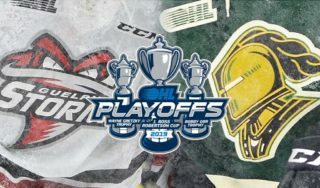 An 8-1 win over Erie on Friday night at Budweiser Gardens did bring out the word perfect to describe the London Knights in November. They went a flawless 12-for-12 and extended their winning streak to 13 consecutive games. The last time London posted a perfect part of the calendar like this was in 2012. London is now 15-0-1 in their last 16. Connor McMichael recorded a hat trick against Erie, Cole Tymkin scored twice, and Matthew Timms got his first goal in a Knights’ uniform. London scored at least seven goals for the third time in their past four games and improved to 19-4-2 on the season. Joseph Raaymakers made 34 saves in net for his tenth victory in 2018-19. The Knights got two early power-play chances and made good on both of them. Cole Tymkin opened the scoring at 3:32 of the first period on a man advantage as he put a pass across the crease that deflected off an Erie player into the net. Just under two minutes later Connor McMichael backhanded home his 15th goal of the year to put London ahead 2-0. 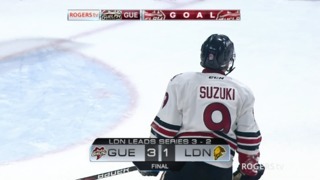 Alex Gritz got Erie on the scoreboard at 14:28 of the first period with a wrist shot from the right side of the Knights zone to cut London’s lead to a goal. Just 47 seconds after that, Tymkin cut in front of the Otters goal, got one chance that was stopped, stayed with the puck and buried his own rebound for his second goal of the game and a 3-1 Knights advantage through 20 minutes. In the second period, London defenceman Matthew Timms tightroped the blue line from the left side of the ice to the right side and then angled through the high slot toward the net where he drew Erie goalie Daniel Murphy out of position and scored his first goal of the season and his first goal as a Knight. Jacob Golden’s second goal of the season made it 5-1 London at 14:34 as he converted a centering pass from Alex Formenton. 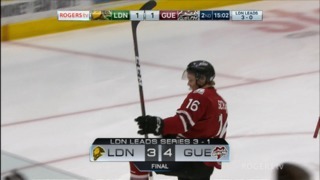 London closed out the game with three goals in the third period. Connor McMichael scored the fourth Big Mac Attack goal of the year, putting the puck in the opposition net during a two-minute window on the scoreboard so that everyone in the crowd went home with a Big Mac. Luke Evangelista picked up his first point as a Knight as he set up Josh Nelson for a 7-1 London advantage and then McMichael completed the hat trick at 14:55 to close the scoring at 8-1. The 2019 World Junior Hockey Championship is less than a month away and Canada’s final selection camp roster is due to be unveiled on Monday. Some Knights names are expected to be on it. Alex Formenton won gold with Team Canada last year in Buffalo and would be an important returnee. Evan Bouchard’s name could also appear on the list, as could Liam Foudy’s. Foudy is only 18-years old and the World Juniors are always considered to be a 19-year-old’s tournament, but he played in both games of the Canada/Russia series this fall and also participated in the World Junior Summer Showcase in Kamloops, B.C. London goaltender Jordan Kooy leads the Ontario Hockey League in both goals against average and save percentage and was added to the Team OHL roster for the Canada/Russia series. Like Foudy, he is 18 and even if his name does not appear on this year’s selection camp roster, Kooy has definitely made it onto the Team Canada radar. The annual Teddy Bear Toss will take place on Sunday, Dec. 2, at Budweiser Gardens, when London and Sarnia go head-to-head for the third time this season. The Knights still hold the Ontario Hockey League record for the number of bears and stuffed toys thrown onto the ice. They collected 10,671 plush toys for the Salvation Army’s Christmas Hamper program in 2012. The Knights and the Sting meet on Sunday. Sarnia is coming off a tough outing against the Flint Firebirds where the Sting give up five goals on the first seven shots of the game and lost. 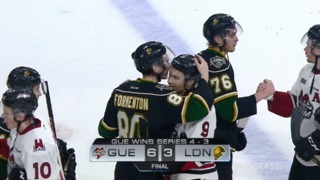 London defeated the Sting 7-6 in overtime on a goal by Liam Foudy on October 12 in London and then 4-2 in Sarnia on October 21. Fans bringing teddy bears to Sunday’s game for the Teddy Bear toss are reminded that all plush toys must be in bags when they hit the ice in order to be used by the Salvation Army.